A Boeing CST-100 spacecraft is shown atop a United Launch Alliance Atlas 5 rocket in this artist's illustration. The CST-100 is a capsule-based vehicle designed to carry seven astronauts into low-Earth orbit on trips to the International Space Station or other orbital destination. This story was updated at 6:37 p.m. ET. Boeing's new spaceship to fly astronauts into orbit for NASA and other customers has its rocket ride: an upgraded version of the Atlas 5 rocket currently used for satellite launches. All the company needs now are space test pilots. In a deal with the rocket launch provider United Launch Alliance, Boeing has agreed to use the Atlas 5 rocket as the launch vehicle of choice for its new crewed spaceship, the Commercial Space Transportation-100 (CST-100). The first piloted launch of an Atlas 5 rocket and CST-100 spacecraft is slated for late 2015, Boeing officials said in an Aug. 4 announcement. Two Boeing space test pilots will fly the mission, which will blast off from the Cape Canaveral Air Force Station in Florida, though the company is still searching for those crewmembers, as well as other astronaut candidates. "It's another step toward making this a reality," Elbon told reporters in the Aug. 4 teleconference. "It's just really important for the country that we keep momentum … keep focus on this so that we can have a capability for launching Americans into space soon." This artist's illustration depicts a Boeing CST-100 spacecraft approaching a private inflatable space station complex designed by Bigelow Aerospace. Since NASA's 30-year space shuttle program shut down in July, the space agency currently has no American vehicle to launch astronauts into space. "We'll go through a selection process for that," Elbon said. "Certainly somebody that's flown in space would have good credentials and fare well in the selection process, I think." Elbon said Boeing considered several rockets, including those planned by companies like SpaceX and ATK, to launch the CST-100. Since Boeing is a partner with Lockheed Martin in the United Launch Alliance, the final deal was subjected to increased scrutiny to ensure there was no bias in the selection, he added. No price or cost information was unveiled during the announcement. Boeing builds the Delta 2 and Delta 4 family of rockets launched by the ULA, while Lockheed Martin builds the Atlas 5 boosters launched by the firm. Boeing is one of four companies using NASA funding to develop commercial spaceships to launch astronauts into orbit for trips to the International Space Station. The company's CST-100 spacecraft is designed to be a reusable space capsule capable of flying up to seven people, or a mix of crew and cargo, on orbital spaceflights. Boeing's CST-100 vehicle is about 15 feet (4.5 meters) wide and designed for reusability for up to 10 flights per capsule, Boeing officials have said. The spacecraft is not only intended for trips to the International Space Station, but also to ferry crews to future private space stations like the inflatable habitats envisioned by the Las Vegas-based company Bigelow Aerospace, which has partnered with Boeing to provide transportation to their outposts. 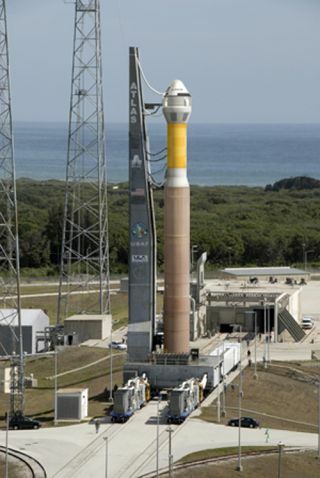 The Atlas 5 rocket stands 191.2 feet (58.3 meters) tall and comes in several configurations. The rocket that launched the Juno spacecraft on Friday was aided by five strap-on solid rocket boosters. The version that will launch CST-100 will include only a single solid rocket booster, Boeing officials said. NASA's space shuttle program retired for good last month after the final mission returned to Earth on July 21. The space agency is now in a years-long gap between the shuttle era's end and the availability of private spaceships like Boeing's CST-100 and others to launch Americans into orbit. But until those private spaceships are operational, NASA must rely on its international partners for access to the International Space Station. NASA will include cargo on robotic delivery ships launched by Russia, Japan and the European space agencies, while American astronauts will fly on Russia's Soyuz vehicles. Boeing received $92.3 million from NASA in April during the space agency's second round of its Commercial Crew Development Program (CCDev-2) to spur the development of private spaceflight vehicles. Three other companies — SpaceX of Hawthorne, Calif.; Blue Origin of Kent, Wash.; Sierra Nevada Corp., of Louisville, Colo. — also received funding for their own private spaceship efforts. Boeing plans a tiered testing program for the CST-100 vehicle, starting with parachute drop tests and a ground-based demonstration of the spacecraft's launch abort system, an escape system designed to carry astronauts to safety in event of a rocket failure. If successful, three test flights would follow in 2015, Elbon said. Those flights would include an unmanned launch test of the Atlas 5 rocket and capsule in early 2015, an in-flight launch abort system test in the middle of that year, then the actual crewed test flight at the end of 2015 carrying two pilots into space. "Our approach is to build a reliable spacecraft built on existing simple systems and then integrate that with a proven launch vehicle, all focused on putting in place a very safe system," Elbon said. "One that will be reliable and one that can be operational as soon as practical so we can start flying U.S. crew from U.S. launch sites." Still, Elbon said Boeing will need continued funding from NASA if it is to reach its goal of launching humans into orbit aboard CST-100 vehicles. The company's current funding level for the project will support the CST-100 through the preliminary design review stage, he added.